I hope you've all been having a fabulous week so far. 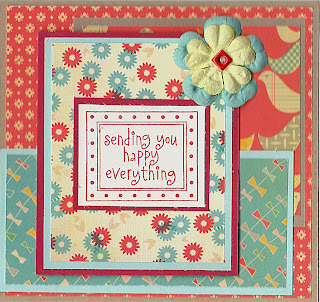 I have two cards to share with you today because I just loved yesterday's SCS sketch challenge. I thought it was just perfect for being able to continue my theme of using pattern paper this week. It was also gave me the perfect excuse to use the new products that I picked up at Hobby Lobby yesterday morning (LOL!!) I am seriously thinking of making a whole set of cards with this layout, that's how much I like it! It was so easy to do. 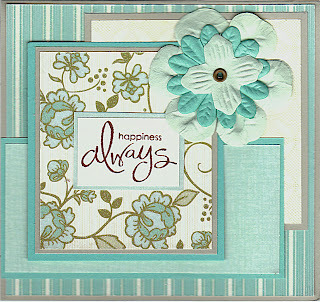 For the first card, I used Sahara Sand along with some papers from a new stack of DCWV papers called "Linen Closet." Let me tell you, the papers in this package are drop dead gorgeous!! Beautiful browns, aquas, blues, and greens. I also grabbed a few loose sheets of paper while I was at the store yesterday to go with the patterns and used them on this card as well. I really wanted the pattern paper to be the focus of the card, so I decided to only use the one stamp in the middle. 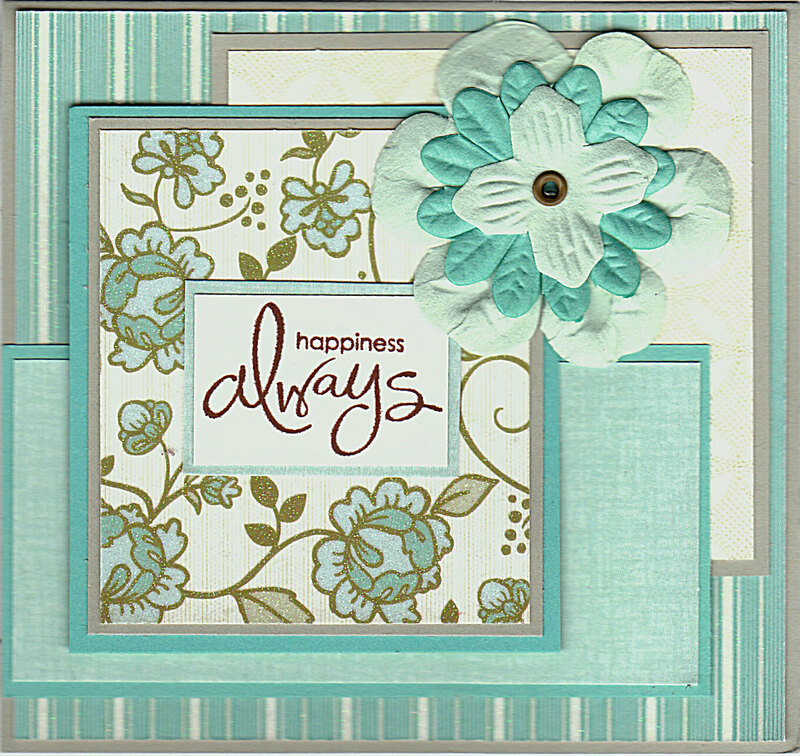 I chose the "happines s always" sentiment from SU's Whimsical Words set because I thought this card would be good for a wedding or an engagement card. I also bought a package of Flowers by Paper Studio and layered three of them in the upper right corner. Ok, so on to the second card. 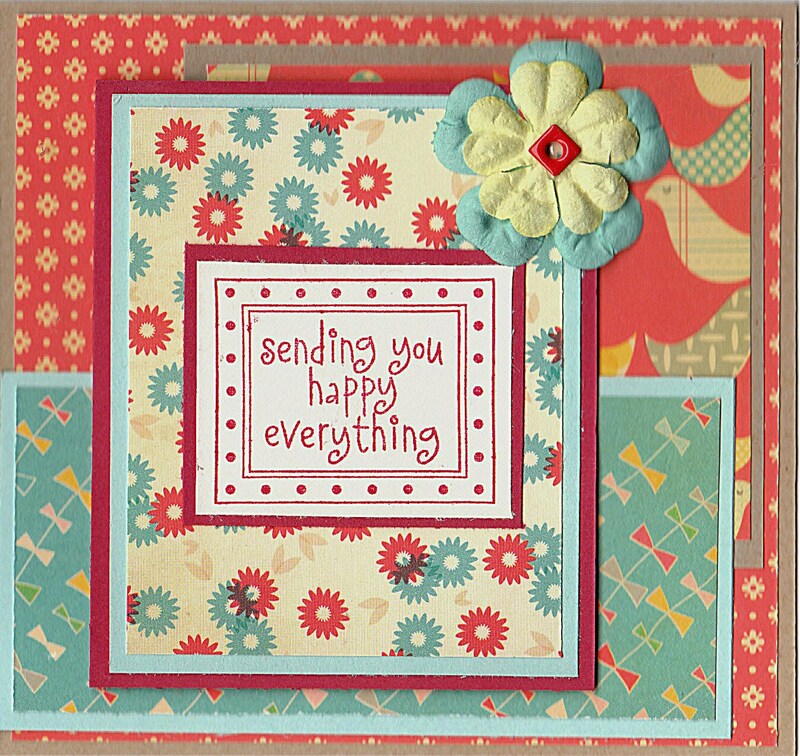 For this card I chose to use Kraft, Aqua Mist and Ruby Red and pattern paper from Cosmo Cricket's Togetherness mini deck. These papers are cute and fun to work with! I stamped the sentiment from Hero Arts Thinking of You in the center on cream paper in Ruby Red ink. Ok, so that's all for me. Thanks so much for spending some time with me and I'll see you all tomorrow! Beautiful cards! I love your paper choices.